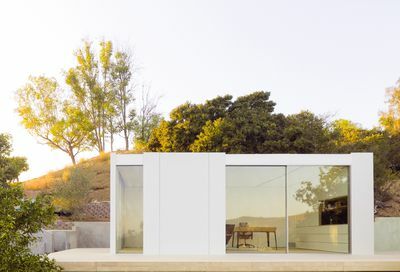 As new state rules make it easier to add small in-law units, granny flats, and studios to the backyards of single-family homes, a new Los Angeles-based prefab company named Cover announced today that it has completed and installed its first such unit. Located in the “northern hills of Los Angeles,” the unit measures 320 square feet and will serve as a music studio and office. It was entirely designed and built in LA. Design and installation took three months and cost $110,000, including building the foundation for the unit, which appears almost cantilevered over its jagged hillside seat. Cover’s designs range from 100 to 1,200 square feet, and can include full kitchens and bathrooms. They are all designed to maximize natural light, feature radiant heating and cooling, and meet energy-efficient passive house standards. Cover leans heavily on computer algorithms, so much so that it considers itself a tech company first. Cover claims it can draw up a floor plan to fit the property and local zoning codes in just three days. A Cover spokesperson declined to say how many orders it has right now, but did say that about half are from Los Angeles. LA-area clients won’t even have to wait long for the unit to arrive: Cover’s factory is located in Gardena.